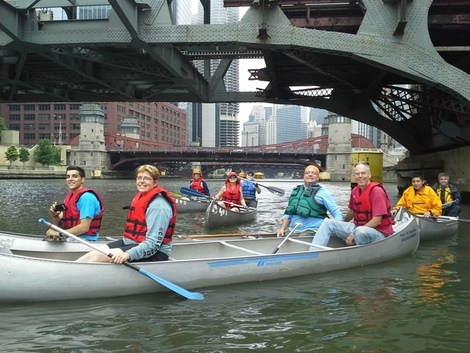 When Friends of the Chicago River was founded, canoeing on the river was unheard of so we launched Urban Canoe Adventures, the first organized canoeing program on the Chicago River, to get people on the water to see the river for themselves. Friends believed that canoeing is a form of grassroots environmental activism. The Clean Water Act sets standards for cleanliness in bodies of water based on the ways in which people use them. As more people began to canoe in the Chicago River, issues of river cleanliness became more urgent. More people on the river helped nudge the Illinois Pollution Control Board in its decision to raise the water quality standards as required by the Clean Water Act. Today, because of our early advocacy, the river hosts a wide variety of public and private canoeing and kayaking programs and rental shops. There has been so much work to improve habitat and control pollution that in the Chicago River system, species of fish have climbed from under 10 to nearly 70, including game fish favorites like large-mouth bass and bluegill and yellow perch.